Doctor Ferzaad Moosa is a refractive specialist and board-certified Ophthalmologist. He is one of the most respected Lasik surgeons in Los Angeles and all of Southern California. Dr. Moosa has performed tens of thousands of LASIK procedures since he started his career as a surgeon in Southern California. He graduated with honors from the University of Southern California (USC) with a degree in Biology. Dr. Moosa continued his education at Harvard Medical School, one of the most prestigious universities in the country. He then served his internship in Internal Medicine at the University of California, Los Angeles (UCLA). After his first year of training, Dr. Moosa enrolled at the Doheny Eye Institute for a USC residency program, one of the foremost programs in the world. It was at the institute where Dr. Moosa began to receive his reputation as the finest surgeon, excelling in every aspect of his training. He performed many microsurgical procedures, such as Intraocular and Corneal Procedures, as well as Glaucoma Procedures. During his time at the Doheny Eye Institute, Dr. Moosa’s greatest interest was in Anterior Segment Surgery which led him to pursue Refractive Laser Surgery. His educational achievements and medical experience gained him a certification to perform laser eye treatments with the LADARVision system, VISX excimer lasers, the Nidek EC-5000, and other top equipment lines. The website Top10Lasik.com, which identifies only the top 10 LASIK surgeons in each state, lists Doctor Ferzaad Moosa as one of the best in California. Doctor Moosa received the Alcon Centurion Surgeon Award for his excellent results and patient care. With this, the website Top10Lasik.com, which identifies only the top 10 LASIK surgeons in each state, listed him as one of the best in California. Doctor Moosa has also trained other ophthalmic surgeons on the performance of Lasik and has held training certification on Alcon lasers. Doctor Ferzaad Moosa has performed surgery on individuals with specific eye care needs; many with very demanding visual requirements, such as athletes, doctors, entertainers, celebrities, engineers attorneys, drivers, as well as his own family and friends. He has the experience and proven track record to provide all of his patients with top-notch laser eye surgery. 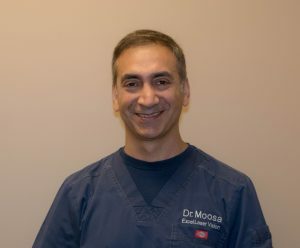 Doctor Moosa’s professional reputation made him one of the most highly recognized and sought-after Lasik surgeons in Los Angeles and Orange County. His appreciation for providing optimal quality care motivated him to bring laser eye care to a new level. This motivation is what led Dr. Moosa to build Excel Laser Vision Institute in 1997 at the current Encino location. Since then, he has opened a second office in Brea. Excel Laser Vision Institute aims to provide a level of perfection in personal service and care that is unmatched by any other Lasik facility in Southern California.